The UK's Thomas Cook Airlines has taken a leaf out of Air New Zealand and introduced its own version of the sky couch, which it is calling its Sleeper Seats! 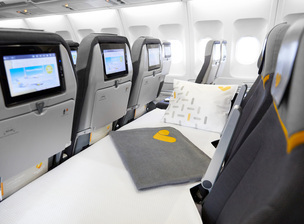 Thomas Cook Airlines’ long-haul routes such as New York and San Francisco will now get a Sleeper Seat which basically transforms a row of three seats into a bed of sorts, designed to allow passengers to start their holiday in a relaxed mode, or indeed come home refreshed!. The Sleeper Seat is basically a comfy mattress that sits across a row of three seats tucked away at the back of the aircraft, cleverly crafted into a sweet space to stretch out and relax. Of course, just because its called a sleeper seat, you don't have to sleep to use it! Thomas Cook says it will allow passengers to use the Sleeper Seat how they wish – to sleep, read, watch a film, listen to a podcast or simply sit back, rest and stretch out. The airline announced the introduction of the Sleeper Seats a week ago and I'm told interest from passengers in the new offering from the airline has been pleasing to them. It's not known at this stage if the sleeper seats will be introduced on all the Thomas Cook airlines.